Do you like having those nice, crispy and toasty sandwiches and wish you could just make them at home? Look no further. With this panini press, you’ll be able to give any kind of sandwich, quesadillas or even pizza that crispy exterior without having to go to a restaurant. This isn’t just convenient, it can also save you tons of time and money. Having one of those will bring the restaurant to your house. You might also be interested in our articles about the best range hoods and the best milk frothers. Having a panini around the house is a smart investment for food lovers. Whether you like throwing occasional barbecues or you just like serving your family -or yourself- a good dish every now and then. Having a panini press around is definitely a life saver, and gives your food that the last touch that just makes it jaw-dropping and mouthwatering. The recipes that can be served with panini presses are virtually limitless. For your comfort, panini presses have evolved in a way that gives them a wide array of applications, some serve not only as a panini press but also as a girdle or a grill. 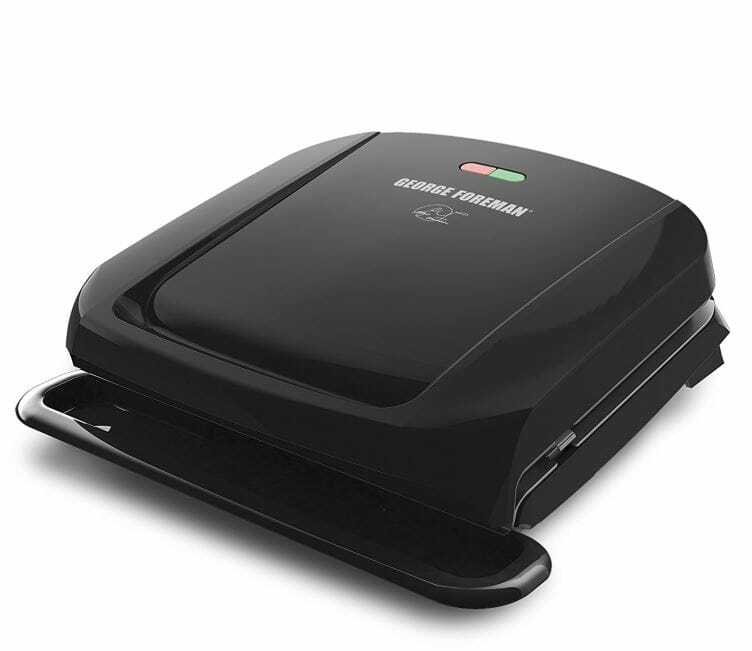 So, whether you’re making boneless chicken breasts or a steak and would love to add that extra grill mark on top of it, or you want to add a toasty exterior with melting cheese to your sandwich the panini press will be able to do that and then some. When you go about getting your new panini press, you might get overwhelmed with the endless options that are out there. At first, they may all look similar. Don’t let the looks fool you though. Panini presses vary significantly in a lot of different factors, so before you purchase the first one that your eyes fall onto, here are some things that you should keep into consideration. 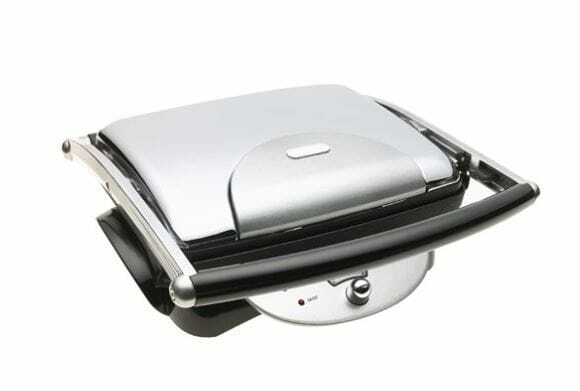 Panini presses are built to handle different amounts of servings. Some are built compact allowing only 2 servings and acting as a perfect companion for couples or roommates. Other bigger models allow for 4 or even 6 servings in a single go, which is really handy if you have a family or you just like to throw an occasional yum-yum barbecue to your co-workers and friends. Before you get the first Panini press that you see you should consider how many people are you going to serve the food for. If you have a family of 5 and you get a Panini press that can only take one sandwich at a time, you’ll spend a whole lot more, wishing you had a bigger panini press so you could enjoy your toasty, yummy meals faster. Nowadays, Panini presses come with a variety of different functions that make them the perfect cooking companions. 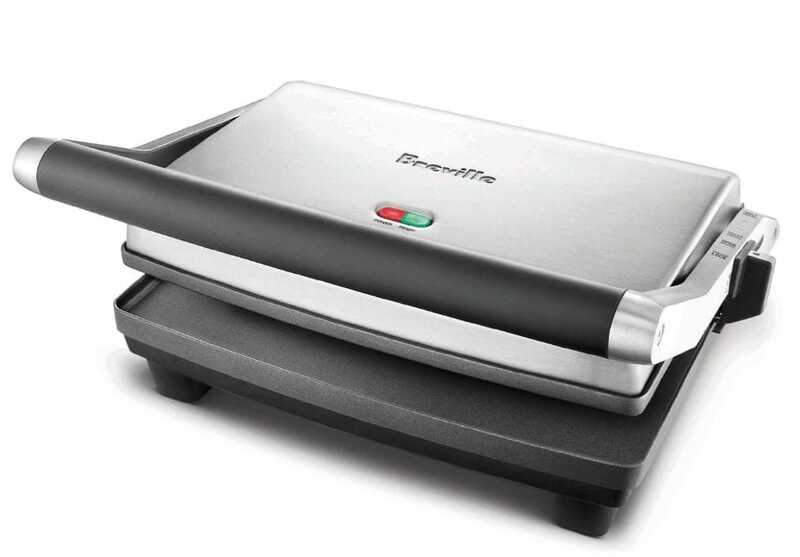 Some Panini presses can be used as a grill, girdle or the normal usage: a panini press. Before you purchase any panini press, you should always ask yourself whether you want more out of this it than just its basic functions. Taking a look at our selection of the top panini presses in the market will allow you to find the features that you need in your new panini press. One of the most important specifications that you should consider is the grill surface material. if the grill surface is made from a cheap material, chances are you’ll end up with fat and grease stuck to the grill more often than not. Some panini presses are designed in a way that makes them reduce the fat and grease in your food so it ends up being healthier and tastier. The durability of the plates is another factor that can ensure the longevity and long-lasting life of your new panini press. Now that you’re familiar with the ins and outs of panini presses, it’s time to have a look at the top 7 panini presses that are currently available on the market. The endless features of this panini press make it stand out as a must get for people looking for a multi-functional option. 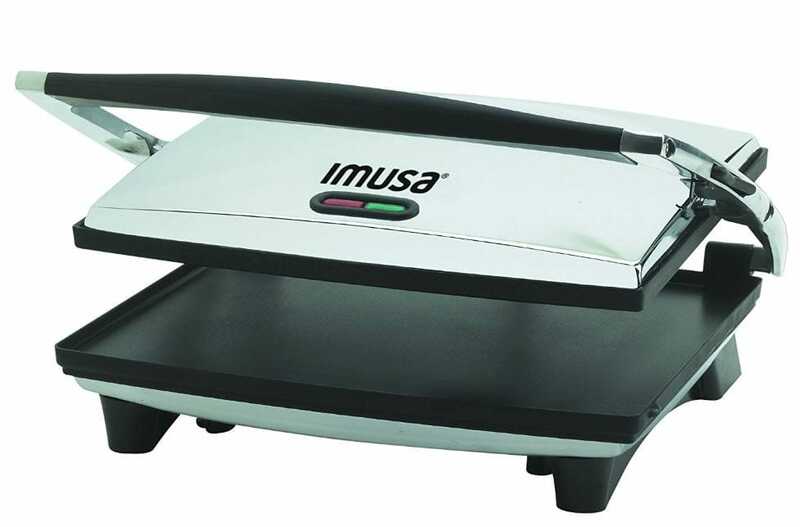 This outstanding device can function as a panini press, contact grill or even a griddle; you can even use it as a half griddle and a half grill. Quite frankly, you can adjust this any way that you want and the applications with it are virtually endless, cooking with this breathtaking device is interesting as it is appealing. The endless features of this Panini press would have you thinking that it has an enormous size but, it’s actually a very compact panini press that doesn’t take much space in your kitchen but doesn’t fail to serve a wonderful dish. The hinge of this press is of the floating type. No matter how thick or thin the serving that you want to cook is, this press can be adjusted to fit it perfectly. Since this Panini press has a lot of different applications, it’s equipped with two temperature controls and a function controller, so you can adjust it based on your use. Whether you want it as a griddle grill or a press, just adjust the switches and this monster will do the rest. It doesn’t stop there. The cooking plates act as draining machines that free your food from fat and grease making the food lighter and in turn healthier. As for cleaning the plates, those non-stick plates make cleaning the press after each use as easy as possible. All you have to do is throw them in the dishwasher and you’re good to go. On the bigger side of panini presses is this monster, with its large size, this beast can comfortably handle 4 servings without breaking a sweat. With its massive capacity, this panini press is the perfect companion for barbeque parties or big families who just like to have their servings with those grilled marks and toasty bread. Cleaning this model is as easy as it gets. With a high durability coating that prevents sticking, you will have yourself an easy to clean plates. Add to that the fact that they are removable and can be washed in the dishwasher with the rest of the plates and you have yourself the easiest cleaning panini press. Designed with health in mind, this panini press is equipped with a sloped surface allowing it to reduce the grease and fat from your food, meaning you get to have healthier, lighter and even tastier food. As for durability or the plates, the nonstick coating of those plates offer as much as twice the durability of normal coatings, which makes them stand the test of time, and reducing the need for using excessive oil or butter. Since all foods are not of the same height, this panini press is equipped with an adjustable, 1-inch hinge so you can set it to the height that best serves your needs. For extra convenience, this press is equipped with a cutting-edge technology allowing it to heat-up 35% faster than the normal Panini presses in the markets. With such performance, this Panini press has rightfully earned a place on our list. To top it all off, with indicator lights, you can easily tell when it is turned on, and when it is ready to get the barbeque going. Red light means on, green light means it’s preheated and ready. When it comes to storage and size, this one is hands down the top on the list, with its state-of-the-art upright storage design, this Panini press looks nothing less than a laptop bag, making it easy to store in the kitchen cabinets taking close to no space. And the chrome finish polishing of this beautiful masterpiece makes it your go-to press when it comes to compatibility and attractiveness. The floating lid of this Panini press allows it to handle all sizes and shapes of servings comfortably and evenly reducing any chances of overheating particular areas that could result in bad results. Don’t let the compatible and easy-to-store design of this Panini press fool you, this beast can handle 2-3 mouthwatering servings effortlessly. This panini press needs to be pre-heated for as little as 6 minutes, and when it’s ready for a traffic light, it will give a green light meaning throw the servings on the grill! As for pizzas, or even bruschetta lovers, with the hovering lid of this panini press, you can adjust it so that it hovers over servings without coming in contact with them. Lock it there, and you will have the crispy, toasty results in no time. Whether you want to cook a small sandwich or an extra-large one this panini press won’t say no to any sandwich of any height, with its adjustable floating hinge, you can adjust it to any height to match your mighty sandwich or your small boneless chicken. And it isn’t just the height that this press covers, with its massive cooking surface, it can handle more servings than most of the other presses on the market right now. When it comes to cleaning the surface of the grill, with normal presses you would suffer a lot to get the fat and grease off the surface of the grill. However, this panini press is polished with an almost magical, non-stick surface that makes cleaning it seem like a walk in the park. And it doesn’t stop there, for your own convenience this panini press is provided with 2 lights, one for the power and the other for the heat. When it’s ready to take care of your sandwiches, meat or whatever you want to throw on it, you’ll know exactly when it is hot enough to handle them. Wearing a glove while using a panini press is a thing of the past. With those cool touch handles, you won’t need to worry about burning yourself while cooking with this amazing tool. In addition to that, this model has an extra-sleek design that makes it look like a real masterpiece. If you’re looking for a panini press that makes your food taste awesome while looking great, this is definitely it. As for quality, IMUSA is well known for its high-quality products that are the reason for it surviving more than 80 years in the market, making it one of the leading companies when it comes to quality. The 36 square inch surface of this Panini press make it the perfect companion for roommates and couples. Using this press, you can easily cook a complete meal for yourself and your loved one in just minutes. The extra-durable plates are designed with nonstick coating, which makes them easy and fast to clean and reducing the need for oil or butter, and it doesn’t stop there, the sloped design of the plates channel the excessive fat and grease from your meals by up to 42% making cooking a pleasure as it is healthy. The smart technology used in those plates ensure that the height is evenly distributed among the plates, eliminating the chances of any overly heated or cold spots on the plates, resulting in a more even, and professional cooking. The drip tray on this Panini press is where all the excess fat and oils get channeled to. The drip tray is also dishwasher safe, so you won’t have to clean it yourself. Just put it in the dishwasher and you’re done. Easy to use light indicators on this panini press allow you to know when the press is preheated enough for you to put your favorite meals on it to get that crispy, grill-marked sandwich that you’ve long been waiting for. With power and ready lights, this panini press is simple and easy to use for just about anyone. Another one that is on the more multifunctional side of Panini presses is the Panini Duo. The flat bottom plate of this device acts as a pan, allowing you to make eggs or even pancakes on it faster and easier than ever. 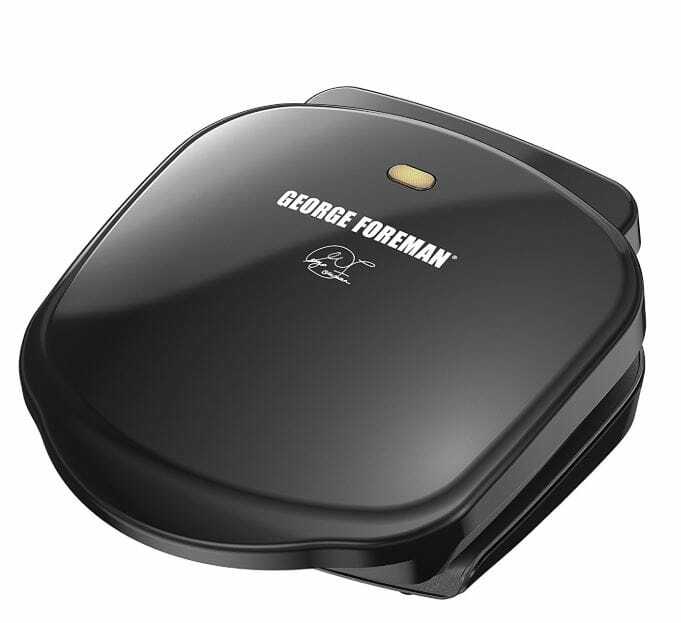 The top plate is ribbed so you can enjoy those lovely grilling marks ton your favorite sandwiches. With adjustable height, you can alter the height of this press based on the thickness of the food that you’re preparing. To ensure that the pressure is even among different sandwiches, this press is provided with a floating hinge. With that, the amount of pressure is evenly distributed among your cooking, ensuring that there is no extra heating for one spot, which could burn the food. Waiting for the Panini press to heat up can be a boring sometimes, which is why this press is polished with a 1500-watt heating element. This drastically reduces the amount of time needed for the plates to preheat. As for the plate’s material, they are nonstick and scratch-proof, ensuring the longevity of the plates and allowing you to clean them after each use with ease. All you need is a wet towel to get the job done, fast and easy. Another thing that’s worth mentioning about this panini press is its incredible design. The silver exterior and green and red lights on this device surely make it a sight for sore eyes, and an art piece that your kitchen wouldn’t be complete without. Equipped with green and red lights, allowing you to identify when the press is turned on and when it is sufficiently preheated so you can get that barbecue started. One of the features that make this panini press stand out like no other is its thermostat which allows you to easily adjust the temperature to the degree that your heart desires. 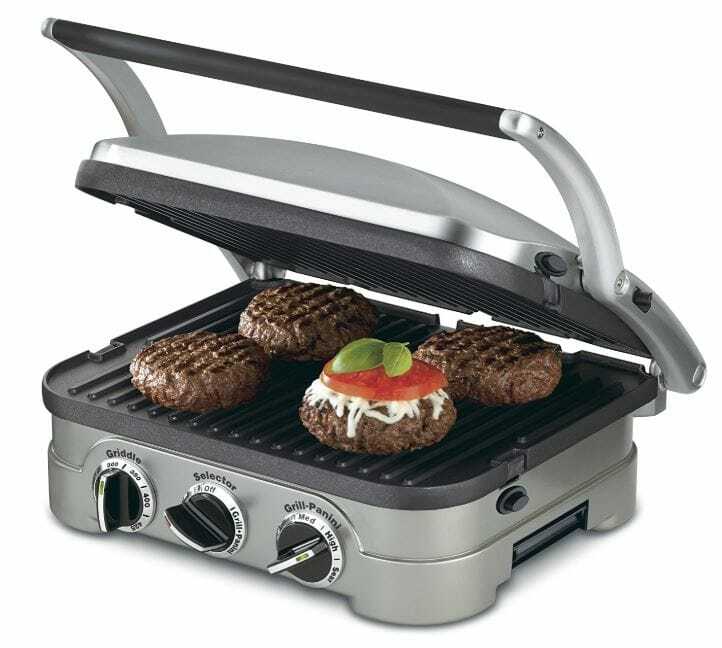 This is a press that provides you with a precise and accurate toasting and grilling machine. So for the more professional cookers out there, this easy view thermostat will allow you to determine exactly how your sandwich will turn out to be. 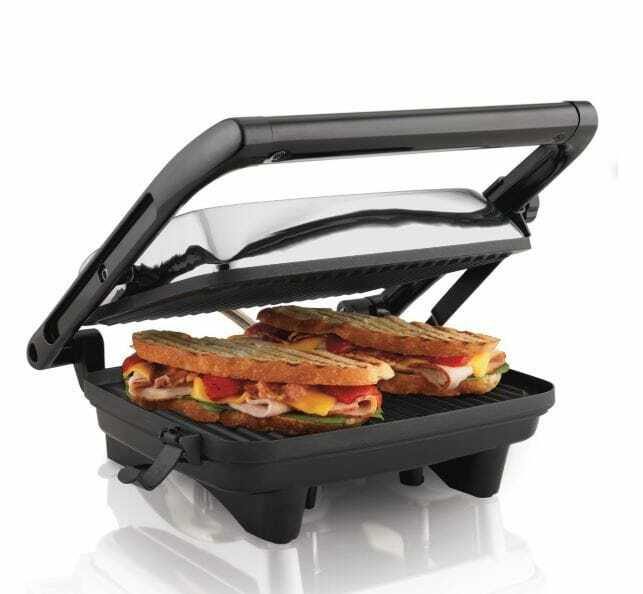 The adjustable height of this panini press allows it to do even the biggest of sandwiches without breaking a sweat. wither you want to grill meat, or make a mouthwatering sandwich this panini press is equipped to just so with whatever size you want to put in it. The slightly tilted surface of the grill will lead the fat and grease outside of the grill and into a cup away from your cooking, allowing you to make healthier and better-tasting food. And when you are done cooking all you need to do is just empty that cup, and wipe it’s nonstick and easy-to-clean surface with a wet towel and your grill will be as good as new. With the cool touch, handles are designed to prevent you from burning yourself while cooking -and ensuring easy movement of the press once you are done cooking with it. If you are tired of wearing gloves while cooking, you won’t need them anymore. Coming with temperature technology that ensures even distribution of heat on the plates, ensuring that your delicious dishes will be evenly grilled. This model has a safety locking system to ensure that once it’s locked it stays locked, so it can be easily stored upright.